This afternoon the Council adopted a resolution setting in place its committee structure and responsibilities for next year. With Tim Burgess retiring and Teresa Mosqueda stepping in, changes were inevitable, and the committee areas of responsibility give us a clearer idea of the agendas for each of the Council members in the coming year. Yesterday the Council had its first public hearing on the draft MOU with Oak View Group to renovate and operate Key Arena. Here’s some quick hits from today’s Council Briefing and Full Council meetings. Monday morning the Council’s Select Committee on Civic Arenas held its first meeting, which entailed a high-level overview of the committee’s purview, as well as the issues related to the SODO Arena and Key Arena proposals that are likely to come before it. The City Council recently formed a new committee to deal with the issues related to competing arena plans for Key Arena at Seattle Center and the proposed SODO Arena in the Stadium District. On Monday, the City Council approved its 2017 Work Program: its list of planned work items for the year. Wednesday morning, the City Council had its first committee hearing on the proposed police accountability legislation. It gave a good preview of some important debates we’ll get to see in the weeks to come. 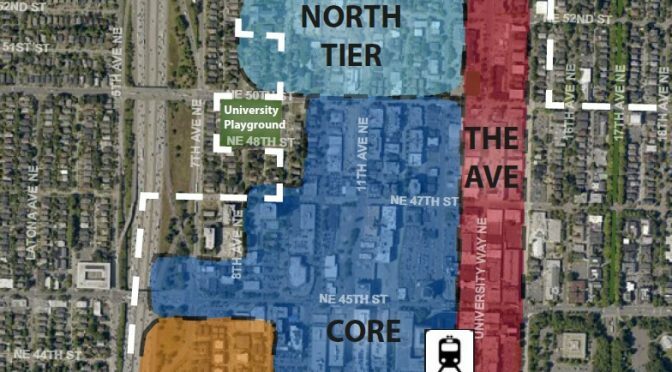 Since 2011, the city has been working on a plan to rezone the University District as part of the long-term strategic effort to grow it into another “urban center.” That plan is now in its final stages, tentatively set to come up for a vote by the Council some time in January. The proposed rezone plan is large, complex, and controversial. Let’s look at what it entails, and what the issues are.